Popcosmo loves discovering up-and-coming new artists and teen singer/songwriter Justine Dorsey recently made her way onto our radar in a big way! "Mature" is not a word generally used to describe songs sung by teens about teen "stuff" but that is exactly what she manages to do. Justine's songs connect to the very soul of teen girls and even made this 30-something "teen" nostalgic with her folksy ballad about things left "Unsaid." In her short 16 years she has already guest-starred on a T.V. show (Brothers and Sisters) and is a second time nominee for LA Music Awards Best Female Singer/Songwriter and Hot Adult Contemporary Single. Her first song, "English Rose" even earned her a nomination for the Los Angeles Music Awards Singer/Songwriter of the year at the tender age of 13, making her the youngest nominee ever for that award. We recently had the opportunity to girl-talk with singer/songwriter Justine Dorsey and hear her dish about her life in the ever-growing spotlight. Age: 16- nearly 17! Always has: Loved books. Proudest of: The songs I’ve written. Is thankful for: My lovely, supportive family. Wants to: Live in a cottage by the English seaside. Is afraid of: Um… pretty much everything that can be labeled as “frightening”. I’m a big scaredy-cat. Believes everyone should: Travel. Is embarrassed by: Myself. I can be very awkward sometimes. My style is: Eclectic. Sometimes I feel J Crew-preppy, other times I feel Free People-bohemian. I love experimenting and becoming different characters through my clothes. Pet peeve: Bad grammar! It drives me nuts. Especially when people confuse your and you’re, or there, their, and they’re. It’s really not that hard, people! 1. When did you realize you liked singing? Around seven, I think. I knew I wanted to be a songwriter when I was thirteen, and since then, that need and that love for doing it as a career has only become stronger. 3. Who are your influences? What artists/bands do you look up to? I’m inspired/influenced by/in awe of Ingrid Michaelson, KT Tunstall, Carole King, Joni Mitchell, the Beatles, Damien Rice, Glen Hansard & Marketa Irglova, Adele, Mumford & Sons, Taylor Swift, Ed Sheeran… The list goes on. It’s always growing and changing! 4. I’m sure the comparisons are there between you, Taylor Swift, Miley Cyrus or any other young female artist. What sets you apart? Ah, I’m not terribly good at saying “what sets me apart” because I think on some level that involves insulting the other artists’ work… I’m just writing what I honestly feel and what I connect to, and hopefully that comes across. 5. Do you prefer acting or singing? I love both. I am focusing on my music more, though. My sister is an actor and sings too, but acting is more of her focus. So we both have our own thing going on, which I think is nice. 6. I read that you have a crush on the Holden Caulfield character from Catcher in the Rye. One of my favorite characters as well! Any other books that you're crazy about or reading right now? I’m so happy you asked this question! If you love The Catcher in the Rye, just please read The Perks of Being a Wallflower by Stephen Chbosky. It’s so stunning. (And the movie looks like it’s going to live up to the book, which I’m so happy about!! Fingers crossed, right?) I also loved How I Live Now by Meg Rosoff and Just Kids by Patti Smith. These are the types of books that shape the person you are, I think. Oh! I just finished Girls Like Us by Sheila Weller- it’s the biographies of Joni Mitchell, Carole King, and Carly Simon, and the effect they had on the women of the 60s and 70s. It’s perfect and I was dreading the end. I’m a huge Potterhead too. I have a couple books lined up to read next, so I’m trying to decide! 7. What do you like to do when you're not acting or singing? Well, I read a lot, obviously. I love going to the beach and watching movies with my sister, and being a goofball with my best friends. And I love cooking and baking. 8. You tested out of high school and are already in college. That is amazing! Any regrets? Do you feel like you missed out on anything? Thank you! I don’t really have any regrets, or feel like I missed out. Every once in awhile, I’ll watch a high school movie, and feel a little wistful, and then I remember how much movies glorify the high school years. In real life, it’s a lot of stress and test-taking. There are good parts, but I feel like I still get to experience those moments with my friends outside of the school environment. So yeah- no regrets! 9. How is your music changing as you get older? I’ve noticed that I’m exploring new worlds musically, challenging myself on the guitar, and my songs are getting a little more complex. It’s very exciting! And of course, my lyrics are maturing as I’m getting older, because I’m having new experiences and moments! I think it’ll be really cool to look back on my musical journey when I’m older, and see how it’s changed and evolved. 10. What’s the weirdest thing that has ever happened to you at a show? I haven’t had too many weird moments yet, luckily- but once I was playing a show and I was wearing a dress made out of a slippery material, and my guitar strap slid off. I’m sure a brief spasm of terror flitted across my face because I was so scared my guitar was going to fall and break!! 11. What are your plans for the future? I’m working with a few licensing companies right now, so hopefully one of my songs will get placed on a TV show or a commercial! I just finished a song in the studio that I’m planning to release sometime soon. I have a couple projects in the works that are under wraps for now, but I’m very excited about them! 12. What advice would you give teen girls wanting to break into singing/acting? You’ve got to really want it. I know that seems obvious, but you really have to, because it’s not all fun and games- it’s meetings and rejection and lots of hard work. And you have to keep working and growing, even when the going gets tough. I read this Katherine Hepburn biography and in it she says something along the lines of, “I never gave up because there was always the question of, what if I stopped one day, and the very next day a part came along that I was meant to get?” I always keep that in mind. 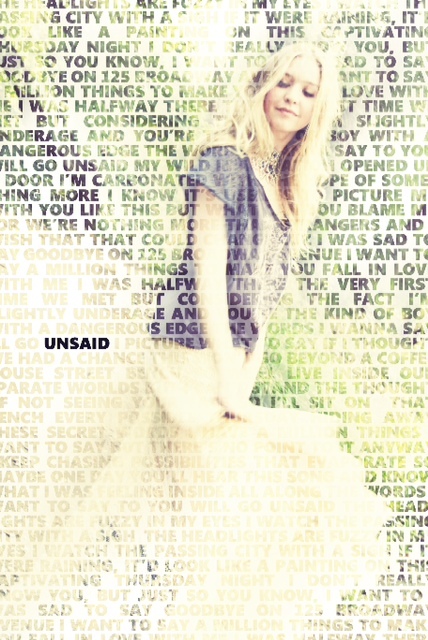 Unsaid was released on May 22 and is available on iTunes and Amazon. To find info on her upcoming shows, visit Justine’s Reverb Nation page: www.reverbnation.com/justinedorsey. Also be sure to visit her YouTube Page: www.youtube.com/justinedorseymusic.